As Americans live longer and longer lives, chronic diseases are becoming an increasingly significant public health issue. The five leading chronic disease killers make up approximately 66% of all deaths in the United States. These include diseases of the heart, all cancers, stroke, chronic lower respiratory disease, and diabetes. As odd as it is for obesity and malnutrition to be such major public health problems, both play an important role in these mortality statistics. In the last 5 years, over 17,000 articles have been published in medical journals relating vitamin, mineral, or anti-oxidant deficiencies to hypertension and cardiovascular disease, cancer, diabetes, and immune system disorders. These articles provide strong evidence to suggest that many of these illnesses possess a nutritional component, and that correcting the appropriate nutritional issue may help an individual avoid or ameliorate the severity of these often lethal illnesses. Even in non-lethal chronic illnesses (e.g. fibromyalgia, digestive issues, mood and autoimmune disorders, etc. ), researchers have identified nutritional therapies that may be beneficial in reducing the incidence or severity of these diseases. Individual nutritional needs are complex. There are a large number of factors that can determine an individual's nutritional requirements, as well as a large number of variable conditions that can influence those factors. Differences in diet and taste preference, digestive capability, nutrient absorption/transportation, and utilization/storage capabilities all have an effect on overall nutrition, and each of these factors can be influenced by different genetic and environmental backgrounds (cultural food preferences, availability of nutritious food, etc.). Layered onto this complexity is the fact that individuals have different nutritional requirements during growth and in different stages of aging, in pregnancy, during wound healing, and when recovering from an illness. All of these different states require different nutritional needs, which makes developing a standard notion of nutritional requirements difficult. Proper nutrition needs to be individual nutrition. It is clear from molecular epidemiological studies that some people will need more than just a balanced diet or the occasional multivitamin to meet their nutritional needs. Traditional nutritional tests can be confounded by a number of issues. Individuals (particularly in affluent countries) have a relatively varied diet, which makes estimating the effect of diet on health difficult, if not impossible to measure (e.g. Can you accurately estimate how many grams of carbohydrates you've consumed in the last year? How much fructose?). Compounding this problem is the fact that most nutritional assays measure serum levels of a given nutrient, and thus only represent a snapshot of the last few days of nutritional intake. Serum measurements also fail to take into account individual differences between people's cells' ability to absorb nutrients, convert them into an active form, and utilize them properly. Difficulties in cellular uptake of a nutrient (or nutrients for which maintaining serum levels takes a higher priority than cellular uptake, like magnesium and calcium) will, all other things being equal, result in higher serum levels versus intracellular levels of that nutrient. This means that under certain circumstances, high serum levels of a nutrient can mask an intracellular deficiency. Another form of nutritional assay is based on analyzing the human DNA polymorphisms for an array of genes implicated in disease, and estimating an individual's relative risk of developing a variety of ailments. This is based on an association between the presence or absence of DNA sequence variants and the occurrence of disease. Unfortunately, these assays can't take into account factors such as the extraordinary biochemical complexity encoded in an individual's genome, unidentified genetic risk factors, the effect of diet on gene expression, or epigenetic issues such as protein-protein interactions. 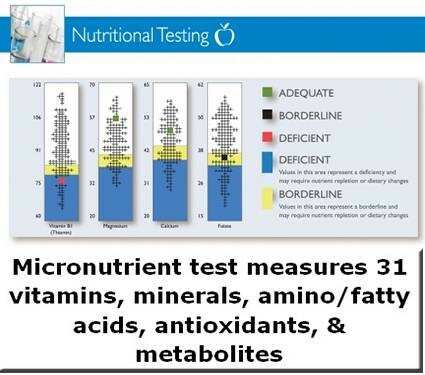 These tests also cannot provide information about current nutritional status. Not to say that there aren't some advantages to serum or DNA assays, but these tests have limitation. Trying to determine nutritional status with a static measurement of a single component of nutrition is like trying to figure out the plot of a complex movie using a photograph of the TV screen taken through a keyhole. The key technology at Spectracell Laboratories, functional intracellular analysis, is an effort to address some of these limitations of other nutritional tests. Functional intracellular analysis was developed by Dr. William Shive at the University of Texas at Austin's Biochemical Institute. Dr. Shive realized that effective utilization of nutrition in medical practice is dependent upon the development of methods for assessing the nutritional status of each individual and identifying factors that limit the nutritional responses of each individual. Dr. Shive wanted to develop a comprehensive assay that took into account all of the factors affecting nutritional status: genetic and individual biochemistry, diet, and the effect of environmental and physical stressors. He also wanted to create an assessment that looked at the cumulative effect of diet over a larger period of time than a few days. Functional Intracellular Analysis (FIA) is the result of that research, and Spectracell Laboratories, Inc. has been performing this test commercially for over 15 years. The idea of FIA at its most basic is that by growing an individual's cells in a solution that lacks a specific nutrient, the cells are forced to rely upon their own stored supplies of that nutrient to grow and divide. By measuring the nutrient-deprived cell growth in comparison to cells growing in a "complete" solution that contains all the nutrients required for growth, the nutritional status of a person can be functionally determined. If a person's cells can't mobilize a particular nutrient (whether for genetic, biochemical, dietary, or other reasons), this test will identify that deficiency. Intracellular stores of nutrients accumulate over a period of months (as shown in studies of nutrient-deprived and replenished laboratory animals), and so may represent a more complete picture of overall nutritional status than other assays. In 1985, Dr. Shive published an article in PNAS detailing the composition of a chemically defined, protein and serum-free media for growing human peripheral lymphocytes (white blood cells). The advantage of this media was that it made possible the relatively simple evaluation of the role of nutrients and anti-oxidants on lymphocyte growth. The advantage of using lymphocytes is that they are relatively easy to obtain, and presumably reflect both the genetic and biochemical make-up of the individual at the time the cells were formed. Furthermore, because the washed lymphocytes used in the procedure have only their internal stores of nutrients to draw on for growth, and because changes in intracellular nutritional storage occur over a fairly long period of time, they may represent a far more reliable assay for overall nutrition status than serum nutrient measurements. One can easily imagine that the changes in a person from abrupt changes in diet (e.g. loss of appetite or fasting), strenuous physical activity, or acute injury/illness might dramatically alter an individual's blood serum levels for a particular nutrient, while intracellular changes in nutrient status are a much more gradual process, and perhaps less susceptible to short term changes in diet or metabolism. To determine the nutritional or antioxidant status of a patient, three approaches are used. The simplest involves growing the cells in a medium in which a particular nutrient is absent. For example, cells can be grown in media which has everything a cell needs to divide and grow except vitamin B1. Under these conditions, a cell must rely on its internal stores of vitamin B1 to divide properly. If these stores are sufficient, the overall cell count will be comparable to the positive 100% complete media after 5 days of growth. If the patient is deficient in vitamin B1, or cannot use vitamin B1 efficiently, their internal cellular stores of vitamin B1 will be insufficient, and the cells will not grow well in vitamin B1-free media, compared to the positive control 100% media. In this case, low cell counts relative to the positive control are indicative of a deficiency. A similar method is applied to most of the vitamins and amino acids tested. The second approach involves supplementation, and is used for nutrients that aren't present in our positive control media. In those cases, the nutrient is added to our test media, and compared to the positive control media. If the cells grow at a greater rate in the nutrient supplemented media (compared to non-supplemented media), that is considered to be due to a deficiency. In this case, high cell counts relative to the positive control are indicative of a deficiency. The last approach involves growing cells in antioxidant supplemented or depleted media, and exposing the cells to oxidative damage via cumene peroxide. The capacity of cells to respond to oxidative damage in the presence or absence of various anti-oxidants (Selenium, Vitamin E, Alpha Lipoic Acid, etc.) is then compared and evaluated in order to determine an individual's antioxidant status and overall antioxidant functioning. For a variety of reasons, nutrition has, by and large, played a relatively minor role in modern (Western) medical practice. A primary focus on acute symptoms, emphasis on treatment versus prevention, the complexity and variability inherent in individualized medicine, as well as the relatively recent arrival of functional medicine and nutritional biochemistry, have all contributed to this trend. There are, however, a number of reasons to think that this is changing. Americans are living longer lives, and are increasingly concerned with living healthier as they grow older. As the twin demographics of aging and obesity cause chronic diseases to afflict a greater percentage of Americans, as health costs continue to spiral and as research (in particular human genome, proteome and transcriptome studies) increasingly illuminate the often complex interactions between diet, genetic background and disease risk, patients and clinicians are increasingly looking for supplementary approaches to conventional treatment. There is certainly an increasing interest in preventative and individualized medicine, and the role nutrition can play in disease prevention and treatment.